Yellow jackets are one of August’s more unpleasant pests. 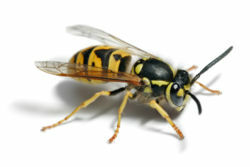 These aggressive predatory wasps are most numerous in late summer and early fall. They live in massive colonies of 4,000 to 5,000, building their nests in the ground, in trees or shrubs, and in protected places around your home, like eaves, attics, sheds, etc. A single yellow jacket is capable of stinging multiple times. If their nest is threatened, they will swarm out and attack aggressively. In Cowpens, South Carolina a man died this past Saturday from yellow jacket stings. Michael Goodwin, 52, ran over a ground nest while mowing his lawn that morning. Within an hour he had died of anaphylactic shock which caused his airway to swell, effectively suffocating him. Goodwin had been stung before with no severe reaction, but that’s the problem with yellow jackets and, in fact, most bees and hornets. Repeated exposure to venom can result in dangerous, even fatal, symptoms, despite a lack of previous problems. Goodwin worked outside and according to his son, John, “He’s been stung probably a hundred times in his life, and it never flared up like that.” Over time, sensitivity to venom can increase to dangerous levels. As summer barbecues give way to fall tailgate parties, watch out for yellow jackets zeroing in on sugary drinks, ripe fruit and overflowing trash cans. Insect sprays and powders can be used to control nests in lawns, but anyone who is worried about a nest or who is planning a large picnic or outdoor wedding should consult a professional exterminator. Avoid yellow jacks when possible. If one flies near you, do not strike at it or run rapidly as quick movements will provoke an attack. Although humans can outrun the wasps, which have a top flying speed of 6 to 7 mph, you could suffer more than a dozen painful stings triggered by your movement before you could run out of range. Don’t strike or crush a yellow jacket against your body. This releases an alarm pheromone that can incite a frenzied attack. If yellow jackets are bothering you, your best defense is to cover your face with your hands and back away slowly, making sure not to step on a ground nest. Move indoors if at all possible. I was stung last year about 3 times after running my lawn mower over a nest. A few days later I was able to destry the nest. Found out I had another nest somewhere in my front door. Got stung in the ear. A nurse said the yello jackets are extremely aggrssive last year. Lack of food – meat, sugary drinks, flowers, etc – makes them very aggressive and more likely to sting with no provocation at all. Ths all happens in late summer – August / September timeframe. Yellow jackets are horrible. I understand they can be beneficial but they’re way to overly agressive to even bother letting stay around. We seem to have a nest about 30 feet away from the front door and if I go out on my porch they start to swarm me. They attacked my grandma and stung her about 5 to 7 times and all she did was see them and stand still. Then she ran after being stung 4 times. I can’t wait until the nest is gone. Yellow jacket nests seem to be forming earlier this year. Had some aggressive insects on our property this week-end. Is it the high summer heat? Also did the warm winter encourage them to nest earlier? We live in Columbia South Carolina. I’ve been swarmed before…I really respect them! Just stumbled on your site looking for facts on the topic after a bad weekend experience I was cutting weeds down on a fence line and was about 8 to 10 feet away from what turned out to be a very angry nest of some sort of STINGING ground bees… well needless to say some 25 plus stings later and a short run to a water hose for help and relief..I can atest that this is not a way to end your labor day weekend. Some local swelling and the on set of restricted air way but otherwise doing well.